Barb's Three Wishes.....Pool, Beach, Sunsets!! 1. A beautiful pool to swim in. 2. Soft, white sands to walk in. 3. Glorious sunsets to marvel at. Wishes granted!! Let yours be, as well! famous 'white powder' quartz sands of Siesta Key's Crescent Beach. Private access is provided right across the street. Master Bedroom has a new king size bed and the guest bedroom has twin beds. There is a sofa bed for additional sleepers. Internet service is provided within the unit and three flat screened tvs. Restaurants and shopping facilities are a five minute walk and several more are just a short drive to Siesta Village with its many open air restaurants and beach boutiques. the boat docks, lagoon, the pool. At night this area is beautifully lit up with low voltage lighting. Our kitchen is fully equipped and there is a great barbecue area. Checkout nearby golf facilities and the many Florida tourist attractions--all within short driving distance. Beautiful pool has a new enlarged seating area. A new observation deck overlooks the intracoastal waterway. Siesta Beach is ranked No. 1 in Trip Advisor's third annual Traveler's Choice Awards. It also is one of nine Florida beaches that made the cut among the top 25 destinations. Siesta Beach jumped to the top spot after finishing No. 3 in the 2014 rankings. Make your wishes come true!! Quaint and Exactly what we expected! Great unit, we truly enjoyed our time here! After hearing many poor experiences with those who went through the complex we were very thankful that Barb and family keep this unit so nice! Location is perfect for pool or beach use! Only thing missing is a washer and dryer but the complex has one directly across from this unit! The condo location was great. It had a nice pool and close to the beach. We had an issue with the bedding. We contacted Barb the owner, she said she was sending back the cleaner back to the condo. After two days, no cleaner came, we reached out to her and she said the cleaner said everything was clean. The sheets were smelly and stained. The extra blankets smelled too. The pillows on the beds were flat. Overall the condo could have been much cleaner inside and outside on the patio and the entry door. The condo was a little outdated. We are very sorry about the issues mentioned. We have spoken to the cleaner and the only explanation we can come up with is that the bedding in question was on the pullout couch. Perhaps the bedding was not removed by a previous guest and our cleaner was not aware that the bedding was soiled. We will emphasise with future guests that the couch be left open if it has been used. We have several extra pillows of varying size due to the fact that pillow type is a very personal issue. Extras are stored in the linen closet and guests are welcome to use those of their preference. The outside areas of the condo might have had debris due to recent winds and rain. We were happy to see that, despite the above issues, our guest was pleased with the location, pool and access to the beach. The property was perfect for my family. 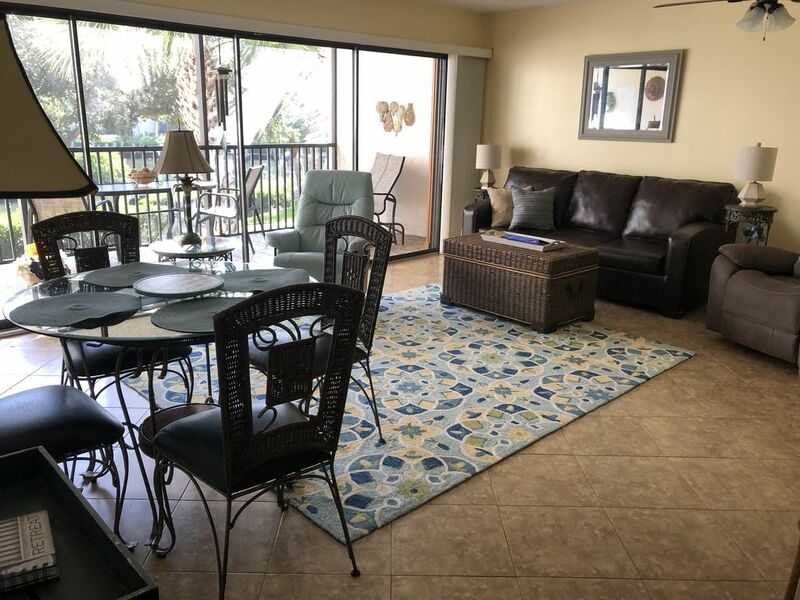 The location is perfect - close to the beach and shopping. The pool was a life saver as the Red tide kept us from enjoying the beach. Our condo had every usual accommodation available, but had some minor repairs and the condo was a little outdated (more than likely from previous renters that didn’t report damage). I reported issues to the Schallers and they were very quick to respond and address issues. The lanai had a terrific view of the intercoastal marina. You can’t beat the crystal white sand of Siesta Key with a short walk to a private access beach. Loved the location of the condo and all the amenities. Short walk to the beach, pool and enjoyed the trolley ride into town for shopping. We had plenty of room for 5, the condo was clean and was easy to rent from owners. We had a great time! A beautiful condo with a great view! We have just returned from a very enjoyable and relaxing vacation. We want to thank Barbara and Lawrence for letting us enjoy their beautiful condo. We had all the comforts of home with a beautiful view. The area offers much to see and do. The fact that you can walk across the street and get to the beach is great. We also enjoy the many wonderful restaurants in the area. We are looking forward to spending our 5th year at Midnight Cove II. May 1 to Jan. 19 $750.00 Jan. 20-Apr. 30 $1150.00 Rates include cleaning fee. Holiday weeks add $100.